The first step to testing Android applications is to inspect the application’s traffic. If the application uses SSL encryption, this requires forcing the app to use an intermediate proxy that allows us to grab, inspect, and possibly modify this traffic. Before Android 4.0 (Ice Cream Sandwich or “ICS”) was released, proxying an application was painful; the emulator was a better solution than a physical phone due to SSL certificate issues. Now that ICS is out and many devices have a working build (either from the manufacturer or third-party), it has become much easier to use an actual phone to test Android applications. There are multiple solutions to this problem, but the best solution I've come cross is using the “ProxyDroid” app directly on a rooted ICS phone. This allows a tester to easily forward all traffic from the real application through a proxy; the only problem becomes SSL certificates, since the proxy will need to use its own SSL certificate, which Android will not recognize as valid. The rooting process is out of the scope of this article, but documentation can usually be found online. The process varies wildly from phone to phone. A good place to start would be the XDA Developer Forums; most devices have a forum dedicated to them, with a General section that usually contains a rooting guide. Rooting your device is your choice- I can't help with (or be held responsible for) issues that arise from a rooted phone. Unfortunately, this proxy setting is just like the --http-proxy setting of the emulator, which means it is completely useless for the actual proxying of applications. This leaves testers with the best option being a rooted phone with ProxyDroid running, which will force all traffic to use the proxy. Install the application from Google Play or from the developer’s XDA Developers thread. This will not solve all cases, but applications will happily comply. An intercepting proxy running on a computer on the same network (or accessible via the Internet, but this is probably a bad idea). 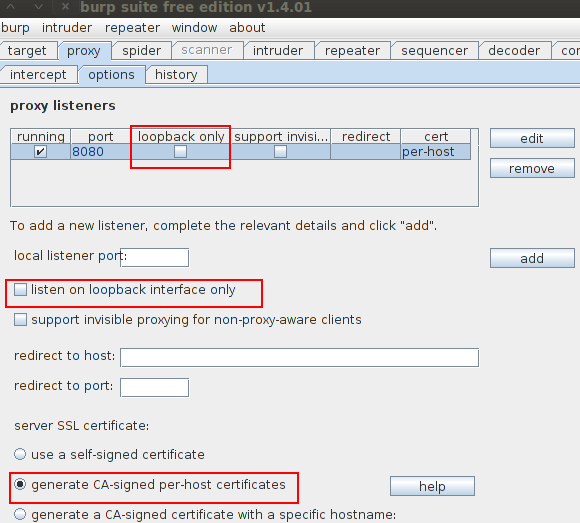 This article uses the free version of Burp Suite running on a BackTrack 5 VM, but if you have a preferred intercepting proxy, it should work, too. Take note of the IP address on the VM as this will be needed soon. Pay particular attention to Burp’s server SSL certificate option, as these are particularly important. Next, start ProxyDroid on the mobile device and allow it root privileges when asked. ProxyDroid requires root, since it uses iptables (the Linux firewall) to modify packet routing on the device. Set ProxyDroid’s Host to the Burp IP and the configured port (default 8080) and then enable the proxy. Finally, test proxying with the basic browser on the phone. Browse to something simple like http://www.google.com and the traffic should show up in Burp. If there is no traffic showing, ensure the proxy is configured to listen on all interfaces (i.e., that “loopback only” is disabled) and that the IP/port settings in ProxyDroid are correct. If these settings seem correct, verify that the phone’s Wi-Fi is set to the same network as the machine running Burp. 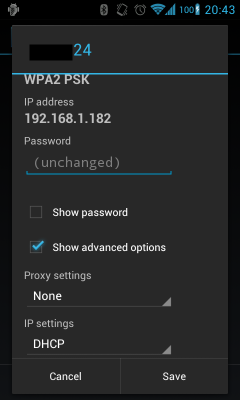 ProxyDroid should also be checked to make sure the IP/port settings are correct and that the app is enabled. When ProxyDroid is enabled, a cloud icon will show in the top left of the phone to let you know that it’s running. With the phones browser now set to proxy through Burp, let's test what happens with an SSL encrypted connection to Google; navigate to https://www.google.com. Pressing OK and then Continue will allow the browser to ignore the certificate warnings and load the page. Now we can see the browser’s SSL traffic, but what happens if an application attempts to access an HTTPS site? In order to test application proxying, we need an application. I've created a very simple app that creates an HTTPS connection to Foundstone’s website. 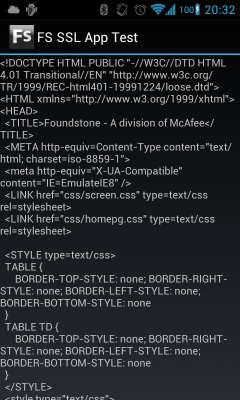 The app will attempt to connect; if it succeeds, it will change the text in the app to the html response source. If not, the application will print a debug message to the log. To fully understand how this application works, I would suggest loading the source code in Eclipse (with the ADT Plug-in and running the code from there. For this test, it’s helpful to be able to view the phone’s system log, either using an attached computer with the Android SDK installed, or a specialized application on the device (for which there are many options). First, let's start ‘adb logcat’ with a filter for “FS”. A debug log tag is commonly used to find specific log messages that are sent by the application. The test app uses the tag “FSFSFSFSFSFSFSFSFS”, so filtering for FS will do. In another terminal, install the application. This command should be the same in either Windows or Linux, as long adb is in the path. With the application installed and logcat running, let's first turn off ProxyDroid and test the application. The application should produce several log messages in the logcat window. These messages are for debug purposes to help step through testing of the application. The application will also change its text to the response received from the server, as shown below. D/FSFSFSFSFSFSFSFSFS(31187): [-] EXCEPTION: javax.net.ssl.SSLHandshakeException: java.security.cert.CertPathValidatorException: Trust anchor for certification path not found. EXCEPTION: javax.net.ssl.SSLHandshakeException: java.security.cert.CertPathValidatorException: Trust anchor for certification path not found. “Trust anchor” in this instance is referring to a pre-accepted CA certificate that can be used to validate the SSL certificate. In other words, the certificate is not signed by a valid CA. This is not unexpected- Burp Suite has generated the certificate and signed it using its internal, randomly-generated CA certificate. 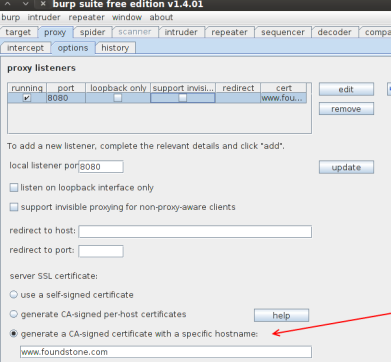 By configuring Firefox to use Burp as its proxy, we can easily see what the certificate chain looks like. Navigate to an SSL-protected page, select Tools -> Page Info, and click the ‘Security’ icon in the top row, and click the ‘View Certificate’ button. You should be presented with a screen like that below. As the image shows, “PortSwigger CA” is the signing authority for the certificate for “www.foundstone.com”. The phone doesn't have this CA (not least because it’s randomly generated on first run by Burp Suite), so we need to add it, which allow us to decrypt SSL traffic sent by our Android apps. Still in Firefox, switch to the details tab select “PortSwigger CA” is selected in the “Certificate Hierachy” tree and then click “Export”. 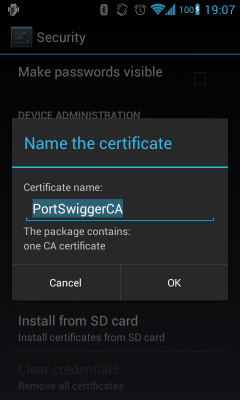 Export the file as an X.509 Certificate (DER) file and set the filename to PortSwiggerCA.cer. Android only reads files X.509 Certificates with a .CER extension when loading certificates from the SD card. With the certificate file saved on the phone, install it into the certificate pool navigating to Settings -> Security -> Install from SD card. The install process will prompt you for the device lock code, as this is what Android uses to help secure the certificate. If there is no lock code or pin currently configured, you will be asked to create one. Now that the CA certificate is installed on the phone, attempt to run the test application again, and observe the output in logcat. Your first thought might be to go back to Firefox and grab the “www.foundstone.com” certificate from the detail tab, in the same manner that we obtained the PortSwigger CA certificate, but that actually won't work. It appears that the default HttpsURLConnection in Android can sometimes cause an exception when using the default HostnameVerifier. Searching for this issue I found some info here which talks about just using a different HostnameVerifier. Depending on the application this could cause an exception or be completely ignored, in my case my application used the default verifier and I would have to install a site certificate as well. The easiest fix from the tester perspective is to reconfigure Burp to use a fixed certificate. 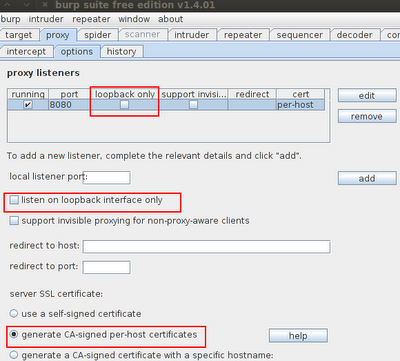 Go back to Burp and edit the settings for the proxy listener. In the “server SSL certificate” section, select the option “generate a CA-signed certificate with a specific hostname.” The specific hostname for this test will be “www.foundstone.com”. Be sure to click “edit” prior to making the change and “update” afterwards. Just prior to clicking “update,” Burp should look similar to the image below. Return to Firefox and refresh the https://www.foundstone.com page; a new certificate error should appear. 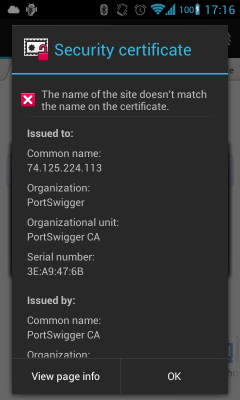 Follow the same process as above to export the certificate, except that this time be sure to export the “www.foundstone.com” certificate instead of the “PortSwigger CA” certificate. Remember to change the format to X.509 Certificate (DER) and to save it with a .CER extension (for example, www.foundstone.com.cer). 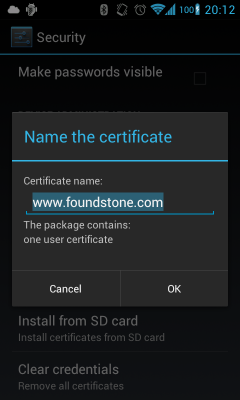 As before, navigate to Settings -> Security -> Install from SD card and install the www.foundstone.com certificate. Finally, double-check that ProxyDroid is still running then run the test application again. 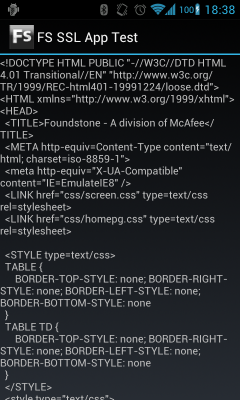 The Android application should display the HTML loaded from the page after being run successfully. Burp will show the site being connected to by IP, as shown below. Where do we go from here? We were able to successfully proxy traffic for this test application, but actual applications may present other difficulties. When testing any application some key points of information will be required- most important being which URL the application talk to. In the example case, we've used “www.foundstone.com” and, thus, created a specific host certificate for this site. For each new application and URL, Burp will need to be re-set to generate a site-specific certificate for the URL in use. One other way to deal with this proxying issue is to decompile the application and do code replacement before recompiling the application. Foundstone provides an example application, part of its Hacme series, and also some documentation on performing class replacement. Performing class replacements like this can be tedious and frustrating, however, so it should be considered only in cases where the application cannot be coerced to proxy via more usual means. After going through this a couple times I didn’t want to deal with installing the certificates over and over so I wrote a small application to handle installing them. The application takes the URL, proxy IP and proxy port and then will allow the user to install the CA or site certificate. For the “hostname was not verified issue” Burp will still need to be changed before the certificate is installed. Install the application using the market or the apk file from github. Set the URL, proxy IP and proxy port. Install the CA certificate which will most likely be the Burp certificate. Name it anything and enter the lock pin or pattern used on the phone. The pin or pattern is used here by the KeyChain activity not the installer app. Change the certificate on Burp to generate a certificate with a specific hostname. Install the site certificate. One large issue I ran into making this application deals with testing the certificate chain. The test certificate chain button will run the test with or without a proxy (if the IP and port are blank). I set up the application this way because a user might be testing or installing certificates with ProxyDroid running and the application should handle that just fine. The issue arises when a user wants to test the certificate chain after installing the CA certificate. The application will also tell the user the site certificate is installed and the full certificate chain is working. This is due to the fact that the class HttpsUrlConnection.openConnectiong(proxy) does not cause the same IOException Hostname Verifier issue as it would without a proxy set. Unfortunately there isn’t a fix for this issue, as far as I’m aware. The code is part of the JDK in javax.net.ssl. I am purposely using this class because it was recommended by the Android developer blog here, the apache HttpClient doesn’t throw the error anyway. As a final note to remember, some applications won’t need the site certificate and watching logcat will be the best way to figure out what’s happening. Stack traces are your friend! i am running ics and i just installed pdanet for android mini computer to let my windows media pc connect sometimes to the internet. now my browser in ics comes up with certificate errors on every site even Googles ???!!!?? i know this is sort of a pdanet question but your help seems interesting and if i can used proxydroid instead i will try that out .. would it work as gateway for my mpc? hey..i copied the certificate and installed it But i am not able to see that in trusted credentials -> user certificates list. are u able to see the certificate that u installed on user certificates list?? You should only see the CA certs, the specific site certificates will not be shown. Example SS I just took http://imgur.com/yIBI6. Also the new burp fixes the site specific issue so you shouldn't need that anymore. Or you shouldn't I ran into issues with the last app I tested. Just make sure to debug and check logcat. 1. Working on an emulator is going to be very different. I only test on actual rooted phones (usually Cyanogenmod roms) as I can easily setup proxydroid and route traffic. If you want to use an emulator look into setting up a rooted emulator build of cyanogenmod. I know one FS con has it setup and working (he said there are some quirks but he was able to test). 3. If you have traffic routed correctly (proxydroid), Charles CA cert added to your trusted CAs (you can view this after adding it http://imgur.com/yIBI6) and SSL proxy turned on for the host in charles there should not be an issue. 4. 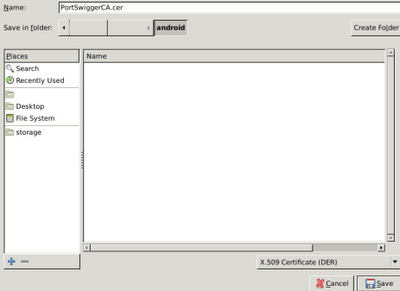 You can try adding the self signed cert to android as well (you will not see this in the trusted list). This is more likely the problem as there is no trust chain involved. You could specify the URL in burp instead of being dynamic and then pull the site specific cert + CA. When I ran through proxy issues like this it turned into trial and error. Try a few different configurations and keep track so you don't repeat them, hopefully you will figure it out.